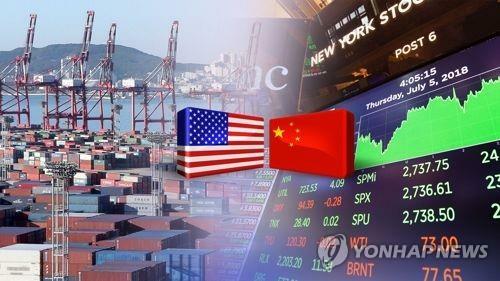 SEOUL, Nov. 1 (Yonhap) -- South Korea's stock market experienced the steepest monthly decline in a decade in October on exacerbated concerns over escalating trade disputes between the United States and China, and signs of China's economic slowdown, analysts said Thursday. The benchmark KOSPI finished at 2,029.69 on Wednesday, wrapping up the month by tumbling 13.37 percent. The tech-laden KOSDAQ fared even worse by dropping 21.11 percent to finish at 648.67. The October performance marks the poorest showing since October 2008, when the main index nose-dived 23.13 percent and the KOSDAQ plunged 30.12 percent in the aftermath of the global financial crisis. During the one-month period, the total market capitalization of the KOSPI declined a whopping 206.12 trillion won (US$180.92 billion) and 56.67 trillion won had evaporated from the KOSDAQ market. True, South Korea is not alone in reporting such a dismal performance, as a mixture of unfavorable factors sparked a wider global stock market rout. But the declines in South Korea were steeper compared with other nations, with the KOSDAQ actually coming at the bottom of 30 main indices among 27 countries. The sharp drop was attributable to a heavy sell-off by foreigners, who accounted for 30 percent of the total holdings in the local stock market. Last month, offshore investors dumped 4.61 trillion won worth of local shares in the KOSPI and KOSDAQ bourses, erasing institutions' buying of shares worth 2.54 trillion won and individuals' 1.76 trillion won of purchases. The overseas investors mainly shed big-cap tech and bio equities, dumping market bellwether Samsung Electronics shares the most, followed by Samsung Electro-Mechanics, Celltrion, Samsung Biologics and SK hynix. "A series of unfavorable external issues appears to have hurt investor confidence throughout last month, and the foreigners' selling binge partly frightened small individual investors and caused their unreasonable panic selling," said Kim Hyeong-ryeol, an expert at Kyobo Securities. "The monthly drop was somewhat excessive compared with the fundamentals of the local economy and the stock market, and the KOSPI now is extremely undervalued," he argued. But such a steep fall does not necessarily mean a chance for a major turnaround and the local market might be swayed further heading into major global political and economic events, according to experts. "Eyes are on the U.S. midterm election and the possible summit between the leaders of the U.S. and China, as their results will heavily affect the sentiment of global investors," said Yoo Seung-min, an analyst at Samsung Securities. It is less than a week before the election day in the U.S., which stands out as particularly consequential across the globe because President Donald Trump has upended U.S. foreign policy and its subsequent impacts have mainly changed the overall trade and economic picture of the world. While trade talks between Washington and Beijing have stalled, Trump and Chinese President Xi Jinping are expected to meet at the Group of 20 summit at the end of this month, though it is not clear if trade will be on the table. Calling for "being more conservative and well-prepared for the possible extension of high volatility," Samsung's Yoo forecast that the KOSPI would move between 1,950 and 2,120 points. Park So-yeon from Korea Investment & Securities was a bit more optimistic by putting her KOSPI forecast at the 2,000 to 2,200 level. "As long as global trade spats continue, any meaningful upturn is unlikely," she said, adding the possible hike in the U.S. interest rate is also a source of worry at a time when momentum for the U.S. economic growth could fizzle out. "But the credit default swaps premium that shows chances of default risks is quite low, and the quite attractive valuation of some local equities could at least prevent investors from going into any further panic selling."